Like TV quiz shows, you will love Big Bad Quiz. It’s a fast, fun and furious trivia quiz game hosted by the one and only Bag Man. He is one crazy quiz master and has scoured the universe for the toughest questions ever. 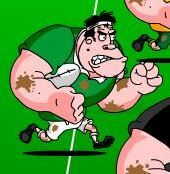 With topics like sports, music ,movies, history and celebs, the full game features over 150+ levels of ultra fast non-stop rounds. With only seconds to answer each question, a fast brisk brain and snappy fingers are needed. No waiting for other players, just get going. The Big Bad Quiz is packed with truck loads of tough challenging questions that will come at you relentlessly. While playing, you will be presented with a mixture of topics, so your brain has to stay alert at all times. Be warned though, you will have only a limited number of game lives before the Bag Man busts you out of the game. BFactor – this ranking is a combination of your speed and accuracy in answering questions. Highscores – the game features a global highscore table. See if you can get ranked. Extra Lives by Sharing – you can get extra lives by sharing your achievements on Facebook and Twitter. Hall of Fame – the Bag Man will feature players who contact him with mega highscores. The Big Bad Quiz is not for the faint hearted – like a rhino on roller-blades, it is big, mean and fast. So you are planning your next digital campaign for the Irish market. You’ve got all boxes ticked; SEO, PPC, banner ads, social media and blog posts. The problem is your competitor has also got those boxes ticked. – A mobile focused advertising or marketing campaign. Above all, they offer a cost effective solution to increase your online and mobile business. Contact us for more details. Modern technology has taken amazing strides forward over the past few years, and this is just as true when it come to gaming technology. With 2015 fully upon us and a number of Gaming and Technology events having taken place throughout January, we here at Fierce Fun thought it would be a good idea to run through a couple of the major developments we can expect to see in 2015. Virtual reality has been with us since the 90’s when Sega released Sega VR in the arcades (although it never made it to the consoles), but with the creation of devices such as the Oculus Rift, Virtual Reality has made a comeback. Now that Virtual Reality has once again hit the mainstream, it has become a realistic goal for video game creators to make VR games.This has also led to a rise of devices like the Rift, or other devices which make you feel like you are really in the game. With the widespread release of wearable technology, primarily the rise of the smart watch, and with the further & further reach of smart phones, and the inevitable rise of the smart TVs, like AndroidTV, technology is everywhere. Which means that in 2015 we will be able to play games everywhere. With the new challenges and opportunities presented, we can look forward to some new games which take advantage of these opportunities, and perhaps taking augmented reality along for the ride. A trend that will increase across 2015 is the large part of video games industry that Independent studios will play. The mainstream studios are sticking to the tried & tested channels and games. However, with the wide availability of channels, open source software and variety of funding options have made game creation available for independent studios, and they are creating games that are creative, unique and very enjoyable. We here at Fierce Fun are ourselves independent and are currently creating a variety of mobile app games with Big Bad Quiz for Android & iOs being our first title to launch in Q1 2015. Social Media has taken up a large part of our lives over the past decade or so, and it’s reach will only increase in 2015. However, game developers must capitalise on the this trend in order to maintain their success. Consumers are no longer private about their gaming, and want to publish across their various social channels. Sony and Microsoft have both made a leap toward this with the PS4 and Xbox ONE respectively. For companies to be successful in 2015, they not only have to post quality, relevant content on their social media channels regularly. This goes double for smaller creators, who don’t have the brand recognition, and must strive to make a name for themselves. Before the 2000’s, video gamers were seen as a subset of kids and immature men. This changed with the emergence of consoles and the creation of motion sensing technology, like the Wii. Recently, the number of gamers has grown exponentially, and has broken down all gender and age barriers. So in 2015, we will see gaming becoming a more socially respected hobby, as there will be more gamers across all platforms than non-gamers. Also, thanks to the jobs being created making games, and the growing professional gamer sector, the gamers of 2015 will be the most respected gamers yet. DIT, in association with Enterprise Ireland and IADT run the New Frontiers programme, which is designed to help incubate and grow new Irish businesses. Several companies have come through the programme and gone on to bigger and better things. As a way of sharing these success stories, passing down advice, and arranging some good old fashioned business networking, they organise an annual showcase event. Last Friday, on the 5th of December, Fierce Fun was able to take part in this event, demonstrate some of our products, and speak with other businesses in the “Hothouse” programme. Peter Lynch and Jackie Jeter attended the showcase and were both very impressed with what they saw and heard. There were five alumni of the programme, including Alison Stroh, from Dr. Coy’s Healthfoods, and Adrian Walsh of Checkventory in attendance. Both businesses have been quite successful in recent years, and fostered partnerships with more established firms. Dr. Coy’s products, for example, are available in stores like Brown Thomas or Avoca. Sean Mitchell, the CEO of Movidius gave a fantastic keynote address on adjusting to meet market needs and cracking into potential markets. Movidius, after graduating from the programme went on to achieve great success in the US markets over the last few years. For a digital company like Fierce Fun, which offers a product which is instantly available in all markets around the world, Movidius provides a great example for adapting our marketing plans and how to break into international markets. 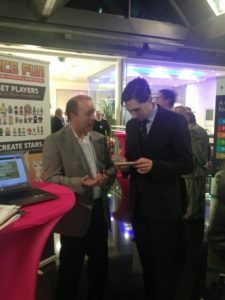 The event gave us a great opportunity to showcase our company to potential investors, as well as getting some cheeky free beta testing done. Peter brought along his phone and demonstrated the Big Bad Quiz to a number of people. All of the reactions to the game were positive, and of course, since the game is designed to be a challenge, not many of the testers got past the first few rounds. For us, who have spent the last few months designing, writing and creating the game, this was a great thing to see. 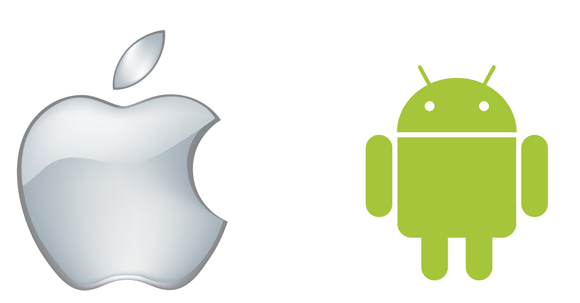 What is a cross-platform app? It is one application that your customers can use, regardless of their phone, tablet or PC type. Most consumers now have at least one of each. Even for large companies, it is difficult to continually update your applications to work on all possible platforms. Think of a cross platform app as being like a central point, with different platforms and devices connecting to IT, rather than having individual apps to suit each platform. Building separate games and mobile applications for each device (iPhone, iPad Android, Windows Mobile) can be time consuming and expensive. It requires different frameworks, languages and developments skills. Fierce Fun uses HTML5 to create media rich highly interactive games and mobile applications. If you like more information on our HTML5 cross platform development technology, don’t hesitate to get in contact. 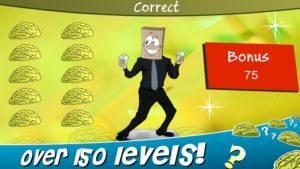 What makes a good trivia game? Making a good trivia game can be a tricky thing to do. First, you have to actually create a lot of interesting trivia questions, then you have to present them in an interesting way. 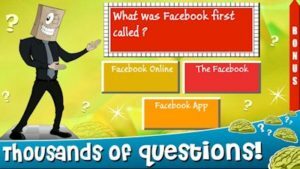 We have seen many simple trivia games come and go without creating much of a following, while game-shows like Jeopardy and Family Feud are still going strong after decades. Why? well, the answer is two-fold. First of all, they have a host. The host is a vital part of a game, whether they are making friends, sharing jokes, grilling contestants with tough questions, or just declaring them the “weakest link”, the host brings something unique and fun to the show. Second, each game-show has a theme, and just like the host, they can vary from unforgiving questions, to light-hearted fun. 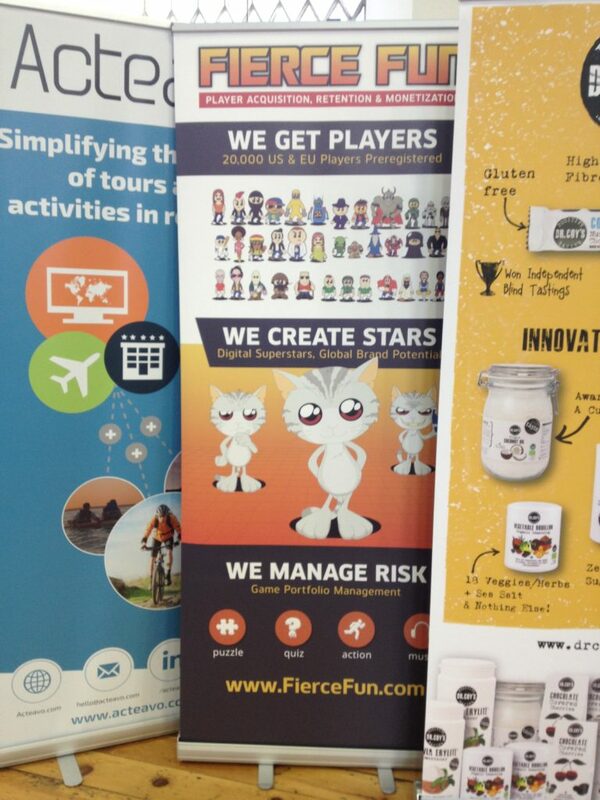 When it came to creating the Big Bad Quiz, we here at Fierce Fun took that information on-board. Thus, the Bag Man was born. He is our answer to hosts like Bob Barker or Anne Robinson, and his style of hosting is reminiscent of the “You Don’t Know Jack” series of quiz games. The Bag Man is sarcastic, insulting, but always encourages you to try a bit harder, to get the extra bonus points, or just to wipe the smile off his bag. When making a game, especially mobile game, you need to consider the time constraint that people will be under. Consumers can’t devote an entire hour to a single session on a game. You need to be able to make a game that is engaging enough that it can be played during a quick-five minute break, or while commuting to or from the office. At the same time however, there needs to be a facility in place to keep people’s attention span over longer periods of time. Again, we looked at game-shows for the answer. Rapid fire rounds were the best solution we found. You could quickly fly through a round or two while waiting for the bus, save your progress, answer a few texts, then come back to the game a little while later and pick up where you left off. Each round takes about ninety seconds to complete, which makes it perfect for “burst players”. In a survey of gamers in the United States, 44% of respondents said that they played on their phones for less than 30 minutes a day. Since the rounds are paced so well, and there is no limit on the number of rounds you can complete, the game can last however long or short you want it to. The biggest games these days, like Candy Crush, or Flappy Bird, also subscribe to this idea of rapid-fire gameplay. Finally, we added some really tricky questions to the mix to liven things up, especially as you get further and further into the game. The rounds might go by quickly, but they won’t all be easy to finish. Adding that to the fact that there are almost two thousand questions, and they all appear in a random order each time you play, means that the game will be fresh, and tough every time you open it up. So that’s our opinion, a good trivia game needs to have a unique host, the ability to be played for short or long periods and above all, needs to be fresh every time you play it, in order to keep players interested.